Git is my favourite version control system (see Why is Git better than X for some good comparisons with other tools, and my GitHub repositories to see what I’ve been doing with it lately). I now use it for all of my programming projects, and many of my writing projects (as I’m now using LaTeX for nearly all of these). 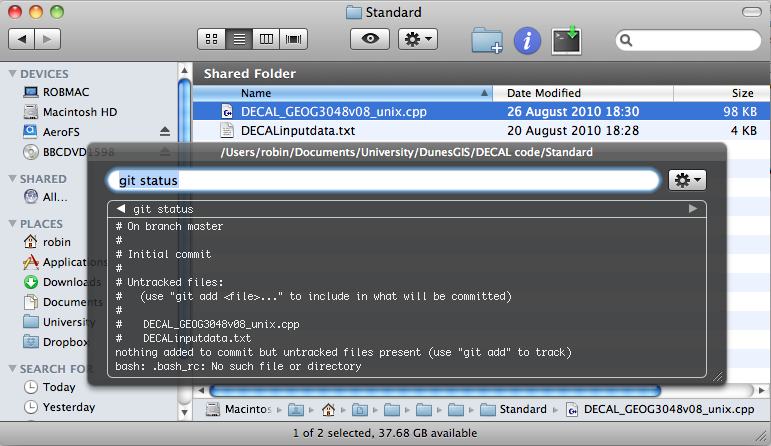 DTerm is a simple utility for OS X which provides a drop-down Terminal in the Finder. The best way to explain it is with a screenshot (see below). When in any Finder window, press Cmd-Shift-Enter, and the DTerm dialog will pop up. You can type any terminal command in the box, and it will run it in that folder, or you can press Apple-Enter to open a full terminal at this folder and run the command. The combination of the two gives what is, for me, the best way to do source control in OSX. I simply use DTerm for all (or most of) my git needs. When I realise I need to get some code into source control, a simple git init in DTerm starts a repository, ready for me to do whatever I want with, and then I just commit using git commit -am "Blah" in DTerm. Simple, fast and all the power of the command-line.